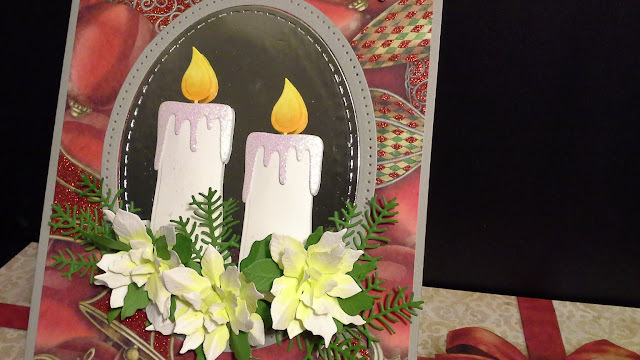 Cut two of the candle dies pc. from white cardstock. Cut the "candle drip" die pc.from white cardstock that you will first apply double sided adhesives to and cut 2 times. (Tape the die down on top of the protective backing of the adhesive blade down} Run through your die cutting machine. Remove the protective backing and sprinkle with Warm Diamond MicroFine Glitter. Tap off the excess glitter. Polish glitter in with your finger. Cut 2 of the "flame" die pc. from white cardstock and color with Copic Markers. Now assemble the two candles. Cut 4 of the "Pine Bough" die pc. with green cardstock and set aside. Cut 3 of the "5 petal base" die pc. from green cardstock and 6 from white cardstock. Cut the small petal die pcs. 3 or 4 times for each petal from white cardstock Then shape all of these die cuts using flower shaping tools and assemble the 3 poinsettia flowers as full as you like them. There is an assembly video on YouTube by Susan Tierney Cockburn for Elizabeth Craft Designs. I highly recommend it if you've never tried making paper flowers. It's sooo much easier than it looks. Nest the 2nd and the 3rd largest dies and tape them together. Then cut them from the same color that you choose for the base card. The result will be an oval frame. 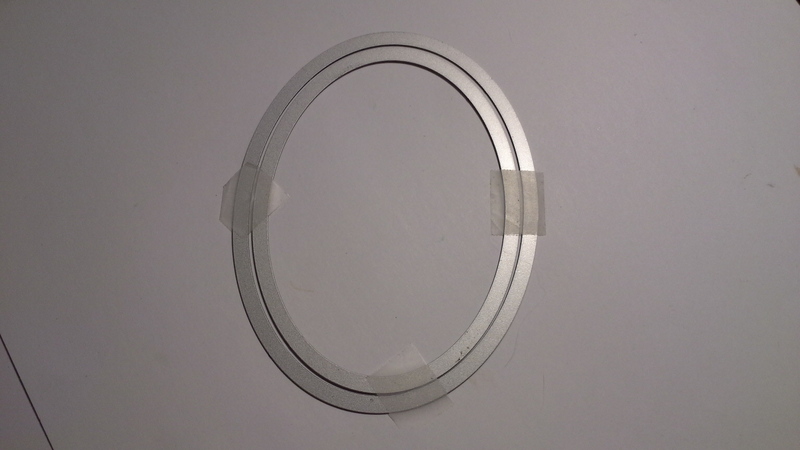 Now using the smaller of these two oval dies, cut an oval from silver mirror cardstock. The 4th die set is 1467 - Words 3 - Happy Holidays which is currently unavailable in the store but DiesRUs carries sooo many of our favorite brands and any holiday sentiment would work. The fun step! Score a 5.5" x 11" pc. of cardstock in a color that will coordinate with the designer mat the will be the first layer on the top of this base card, at 5.5". Fold over for a book fold card and trim to 5.5 x 7". Now, choose a holiday paper or cardstock and cut a mat that measures 5.25" x 6.75". Adhere this rectangle to the front of the base card. Next center the oval frame onto the rectangle and the silver oval into the frame. Arrange the candles and poinsettia as shown, add a sentiment and your done! Here's a closer look at the focal point. ﻿For more inspiration, come join the fun at the Dies R Us Challenge Blog. 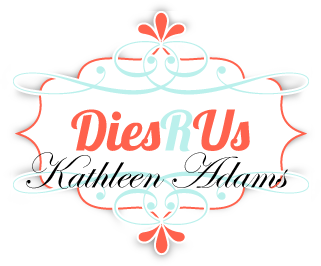 There's a new challenge theme offered on the 1st and 15th of each month, and one lucky randomly drawn winner will receive a gift voucher prize to the Dies R Us Store. For your convenience, all the important Dies R Us links are provided below. What a gorgeous holiday card Kathleen! Love the candles and your poinsettia are perfect! Thanks for wonderful inspiration!